I am a big fan of The Muppets and The Berenstain Bears. I am not a fan of Chick-Fail-A. 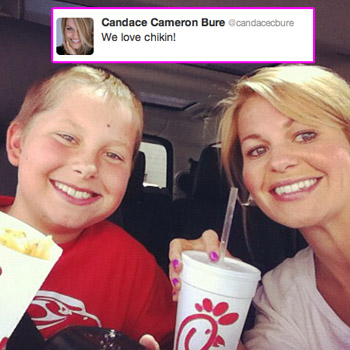 And I’m really not a fan of people bragging about their fat-fried meals at said establishment, like Kirk Cameron‘s sister. This evening I read a college acquaintance’s report that she ate at Chick-Fail-A today and while eating she thought of the gay friends she loves but that she also loves traditional marriage. I felt a pang in my heart, literally. How do I support my LGBTQ friends who physically ache years after physical assaults and verbal taunts? How do I support my Christian friends, some of whom, I believe have love in their heart but are narrowly defining marriage to the point of discrimination? Using their bible to support bigotry? This entry was posted in Headlines and tagged Christianity, Commercialism, Compassion, Gay Marriage, Hate, Love, Politics, Religion. Bookmark the permalink.